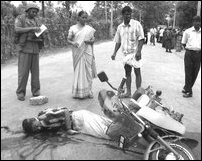 Unidentified gunmen riding in a motorbike shot and killed a 28 year old man, Jeyaseelan Yogalingam, near a Sri Lanka Army (SLA) checkpost located close to Urumpirai Hindu College, Saturday morning at 6:30 a.m., Chunnakam Police said. 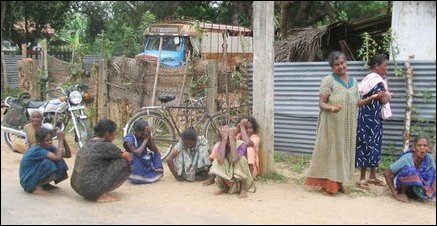 The victim, a civilian from Kuttiyapulam in Vayavilan, once employed in the civil administration run by the LTTE, is a father of a 4 month old baby, civilian sources said. Mallakam Magistrate Ms. Sarojini Ilankovan, who visited the spot and examined the crime scene, ordered Chunnakam Police to investigate the killing. The body was taken to Jaffna Teaching Hospital mortuary by the police.